Summer is here in Colorado with a vengeance. It's hot. Real hot. You want to be in the shade or by the pool with a cold drink. This summer, I'm also leading a discussion at church called Seuss and Sangria. Each week we talk about the Seuss book discussed in the Sunday sermon. And sip a little. Now, this drink isn't sangria by definition, but it's cold, sparkly and has fruit...in my book that's close enough. This is an all-ages treat. For the 21 and up crowd, provide lemoncello as the adult mix-in. A pitcher. There you go. Pour lemonade concentrate into the pitcher. Add ice until the pitcher is half full. Fill remainder of pitcher with sparkling water. Stir to mix. Garnish with fruit. Serve to the delight of your friends. 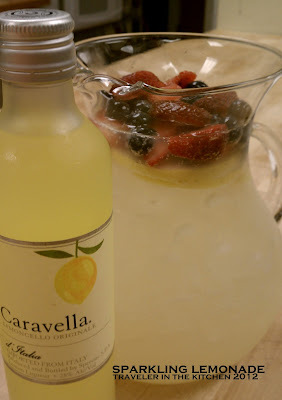 Offer lemoncello on the side for a little added awesomeness. Cheers!